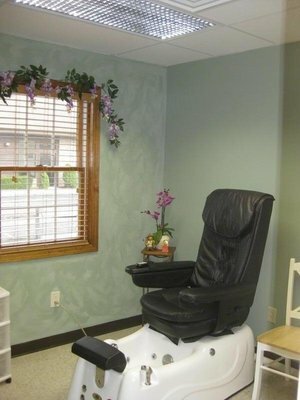 Our facility offers medical nail care as well as cosmetic nail care by a licensed nail technician. "Medical nail care is available for those persons afflicted with diabetes, with circulation or numbness in their feet. Care of the toenails is important to prevent serious complications such as bacterial or fungal infections or even loss of limb. Our doctor will examine you to determine whether this service is covered by your medical insurance. "Cosmetic nail care", is available for those who just seek a pedicure, manicure, rejuvenating foot message, or just have a polish change! Relax and feel pampered while knowing that our facility meets the highest sanitary standards with all instruments medically sterilized. So, treat your feet and show them off while wearing your sandals or flip-flops! Basic Pedicure: foot soak followed by exfoliation & relaxing message, trimming,shaping of toenails and cuticles with polish included. Deluxe Pedicure: foot soak,followed by exfoliation (with your choice of scrub),callus removal,extended message,trimming and shaping of toenails and cuticles. Polish and nail art included. Additional Services: Manicure, nail art, gems and more!